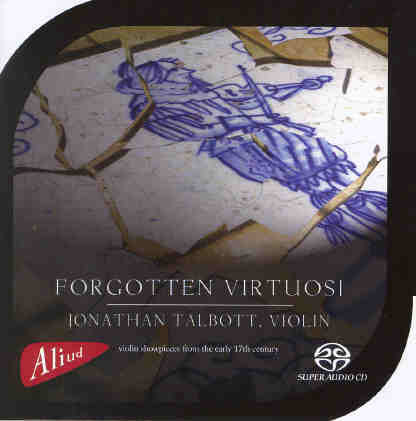 Jonathan Talbott, a specialist in early violins, was heard and enjoyed in Antwerp with his Ensemble Braccio, and this is a welcome reminder of his relaxed and unpretentious type of virtuosity and mellow toned instrument. The violin is a modern copy (Earle, 2004) based on paintings and other research of around 1600, "strung in high, equal tension sheep gut, and played on the arm". There are arrangments of madrigals by relatively obscure composers (Schop, Rognonio and Rognoni !) which are likened to latter-day borrowings by Grapelli and Hendrix.... 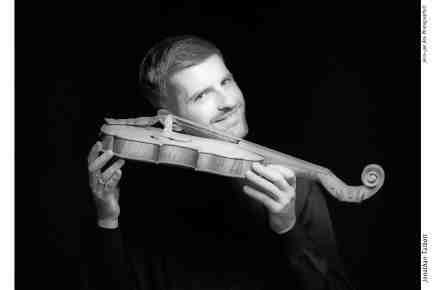 There are too sonatas by Castelo "often heralded as the first truly great instrumental solos". The booklet is not well produced. There are several useful colour pictures but, incomprehensibly, they are reproduced in tiny postage stamp size, although several pages remain half empty. The white on black listings (scanned and reproduced) don't make for easy reading. 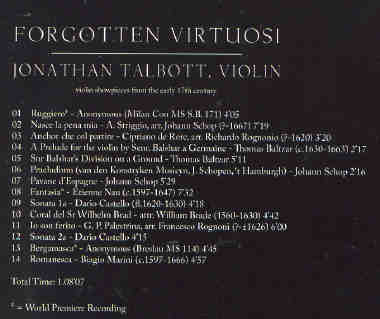 Nonetheless, a recommendable CD, which has given us uncomplicated pleasure.